A complete list of the exotic armor that Xur could possibly be carrying. Xur’s irregular schedule only makes his exotic armor collection more desirable. Appearing every Thursday and staying the entire weekend until Sunday, Xur packs his bags with a single piece of exotic armor for each class each visit. The pieces he packs are random each time, so it’s possible to end up waiting weeks for the specific one you want. That being said, his stock isn’t endless, there’s only a certain selection of armor he chooses from each time. Knowing the pool of stock can help you guess what’s coming up next week. 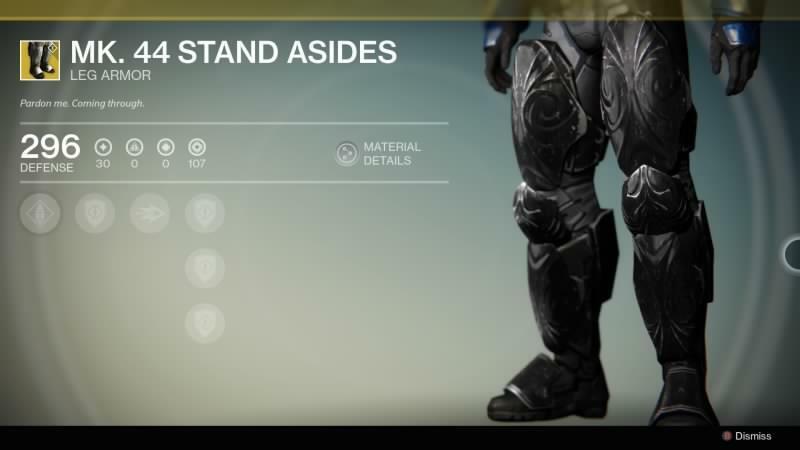 Here’s Xur’s complete list of possible armor inventory for each class. No Backup Plans – Buffs to melee attack speed and Force Barrier Duration. Helm of Inmost Light – Provides headstrong and death from above for fist of havoc. Eternal Warrior – Unstoppable for fist of havoc and health refills with orbs of light. An Insurmountable Skullfort – Storm fist kills refill health as well as orb pickups. Peregrine Greaves – Bonus shoulder charge damage when in the air, increased heavy ammunition capacity. ACD/0 Feedback Fence – Super energy with melee kills, AoE damage dealt when hit with a melee attack. Mk.44 StandAsides – Increased shoulder charge duration and heavy ammo capacity. Helm of Saint-14 – Ward of Dawn binds enemies and minion of darkness kills replenish super energy. The Glass House – Increased melee attack speed, blessing of light lasts longer. Ruin Wings – Heavy ammo drops more often, increased special weapon reload speed. Crest of Alpha Lupi – Teammates Revive Faster, super spawns additional orbs, increased special and auto rifle capacity. Knucklehead Radar – Radar remains when using primary weapons. Increased super energy from killing minions of darkness. Young Ahamkara’s Spine – Super energy from grenade kills, increased reload speed of special weapons. Celestial Nighthawk – Golden gun fires a single shot that deals extra damage and penetrates target. Grenade and minion of darkness kills replenish super energy. Lucky Raspberry – Arcbolt grenade chains further. Increased heavy and fusion rifle ammunition capacity. Khepri’s Sting – Gain invisibility after remaining crouched for several seconds. When stealthed melee attacks from behind deal extra damage. Increased reload speed with primary weapons. 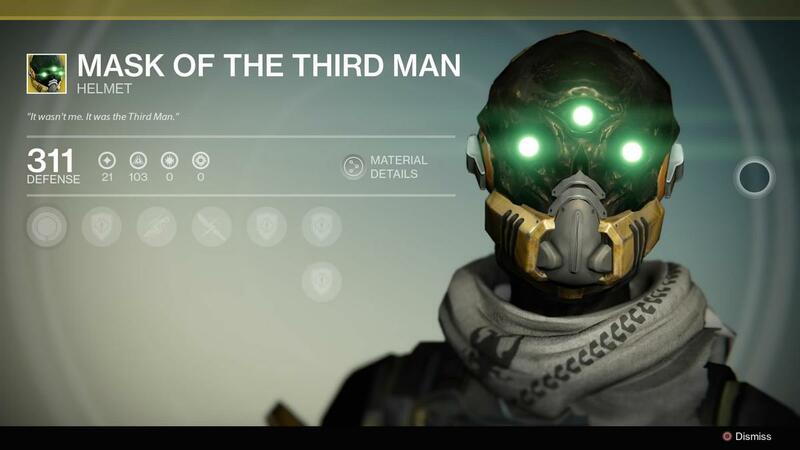 Mask of the Third Man – Arc blade uses less energy. Orbs of light replenish health. Increased melee attack speed. Achlyophage Symbiote – Golden gun gains additional shot. Grenade kills replenish super energy. Radiant Dance Machines – Increased heavy ammunition. Move more quickly when you are aiming your weapons. ATS/8 ARACHNID – Super energy with grenade kills. Golden gun zooms in when aimed. Don’t Touch Me – Taking melee damage makes you invisible. Increased reload speed and super energy from minions of darkness kills. Claws of Ahamkara – Additional melee special charge. Increased melee speed and special weapon reload speed. Starfire Protocol – Increased fusion and heavy ammunition. Adds an additional Fusion Grenade. Sunbreakers – Melee reduces grenade cooldown. Solar Grenade duration increased. Increased reload speed of special weapons. Purifier Robes – Melee damage reduces grenade cooldown. Grenade damage reduces melee cooldown. Radiance disorients nearby enemies. Apotheosis Veil – Using super and collecting orbs regenerates health. Melee damage reduces grenade cooldown. Heart of the Praxic Fire – Increased fusion and heavy ammunition. Radiance reduces all ability cooldowns. Light Beyond Nemesis – Revives given and taken go faster. Melee attack speed increased. Orbs regenerate health. Obsidian Mind – Nova Bomb reduces cooldown of next Nova Bomb. Increased super energy from minions of darkness and longer grenade throw distance. Nothing Manacles – Scatter grenades track and have an extra charge. Grenades can be thrown farther and cooldown is reduced with orbs. Skull of Dire Ahamkara – Super energy from grenade kills. Reduced damage taken while using Nova Bomb and Siphon abilities improved. 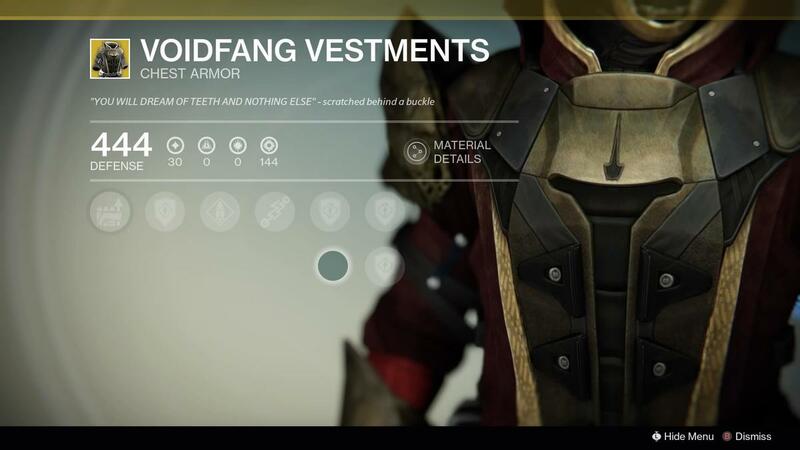 Voidfang Vestments – Axion bolt spawns additional seeker. Hand Cannon and special ammunition capacity increased.